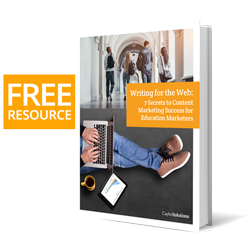 Are your landing pages performing well in your education inbound marketing? If not, these landing page performance killers may be afflicting you. Without high-performance landing pages, your inbound strategy will not work. That’s not an exaggeration. Much like a catalyst in a chemical reaction, landing pages are the component of your inbound marketing that makes desired behaviors happen like email signups, enrollment callback requests, campus visit signups, and more. Secondly, your homepage is not a landing page. Too many schools trying to use inbound marketing just dump everyone at the homepage — it won’t work. So assuming that you’re not using your homepage as your landing page, here’s the performance killers that you need to watch out for. Every page on your website should have a goal that’s attached to your larger inbound marketing strategy. Nowhere is this more important than your landing pages. What’s the goal for each of your landing pages? Headlines are the first chance you’ll ever get to entice your reader to do what you want them to do. They must be useful, urgent, promising, simple, and concise. The question headline. Example: Are you tired of looking for financial aid on your own? Calls to action are the part of your copy that drives conversion merely because they come right out and ask (or tell) your audience to do the thing that will meet your landing page goal. As obvious as it may be to you, your site visitor cannot read your mind. So if you don’t tell them exactly what you need them to do, chances are, they’ll do something else — like navigate away! Marketing personas make your copy and design personal, relevant, and timely. Without them, your landing pages will be vague at best and irrelevant at worst. What kind of value are you offering your visitor in exchange for their contact info or money? You have to make it worth their time to not only put in their information but to receive further communications from you. Your landing page doesn’t exist in a vacuum — it’s part of a broader inbound marketing strategy. You should know precisely how traffic can land on your page and where it will go next. Even if your visitors do what you want them to do, you should offer to take them further into your website on the thank you (i.e., confirmation) page. Especially if you have new, fresh content that would interest your audience, offer it to them in the form of well-written headlines like those irresistible, tabloid-esque ads at the bottom of your favorite news site. Landing pages should have one goal: Get the visitor to do what the marketer wants them to do. That’s why you should clear your landing page of any links that allow your visitor to do anything other than what it is you’re asking of them. That means no navigation bar. No footer. No sidebars. No links other than the call to action and your logo, which I recommend should link to your homepage. Keep your landing pages clean, direct, and concise. Speaking of concise, let’s talk web copy. If the landing page copy reads more like an academic journal than a landing page, performance will suffer. Besides being concise, punchy, and direct, your landing page copy must center on the needs and desires of your visitor. “Org-centric” landing pages show your visitor that you’re only interested in what they can do for you. “Visitor-centric” landing pages focus almost exclusively on the offer — the value the visitor can receive from giving you their info, their permission, or their money. It’s easy to think that you’re building trust with your visitor by writing about how great you are, how many awards you’ve been given, or how much you’ve accomplished. But on a landing page, they don’t want to know what you’ve done, accomplished, or have. They want to know what kind of value is in it for them. High-performance websites make good use of rich content like images and video. Science suggests that our brains process visual information much faster than text, which means that we’re naturally drawn to visual information over text. The math is simple. Rich content such as images, videos, and infographics improve education website performance. You must have them! If your visitor comes to your landing page from Google or Bing Adwords, the copy on your landing page should match the same words you used in your ad. Otherwise, it’s just plain confusing. Chances are if your visitor doesn’t immediately feel as though they’re in the right place, they’ll navigate away, resulting in a high bounce rate and low conversions. Make sure your landing page headline assures your visitor that they made it to the right place by matching the language you used in your ads. If you have multiple AdWords campaigns going, consider creating separate landing pages for each one and track how well each Adwords/landing page combination performs. I know it’s tempting. But you can’t ask your visitor to give you their life’s history all at one time. If you’re asking for their physical address, email address, phone number, birthday, and their mother’s maiden name, it’s probably too much. If all you need to move them to the next step in your inbound marketing strategy is an email, then just ask for that. If it’s a name and an email, then just ask for that. No more than what you need for the next step. Remember, you can always ask for more information (as needed) through your ongoing communications with them. We don’t just live in a digital world. We live in a mobile world. At least half of your visitors are browsing your website (and your landing pages) on a mobile device of some kind. If your landing pages are not mobile friendly, you’re pretty much throwing away 50% of your chances of success. If your landing pages are not performing well, consider placing hero spots such as testimonials or quotes to show (rather than tell) the visitor that you’re worth their time. You should take the chance to tell these stories anytime you can to boost trust within your education brand and increase engagement with your audience. The days of dial-up are far behind us — and no one wants to go back! So, if your landing pages remind visitors of what that experience was like due to slow loading times, then your performance will plummet. Make sure your landing page isn’t bloated with super large images or performance sucking plugins. Keep the backend clean so the user experience is fast. You can expect only what you inspect. If you’re not tracking metrics like page views, click rates, or source of traffic, you’re not going to achieve the performance you’re looking for on your landing pages. Use analytics tools like Google Analytics (free) or paid landing page services with metrics baked right in like Unbounce or LeadPages to see where your visitors are coming from, what they’re doing on your landing page, and where they go afterward. You can’t improve performance if you’re working in the dark. Analytics will show you what’s working and what’s not working. There’s nothing worse than putting scores of hours and thousands of dollars into a website that doesn’t perform well. Get ahold of us today for a free consultation and put our years of experience in marketing, development, and design to work for you.